Chennimalai is situated between Erode and Coimbatore. 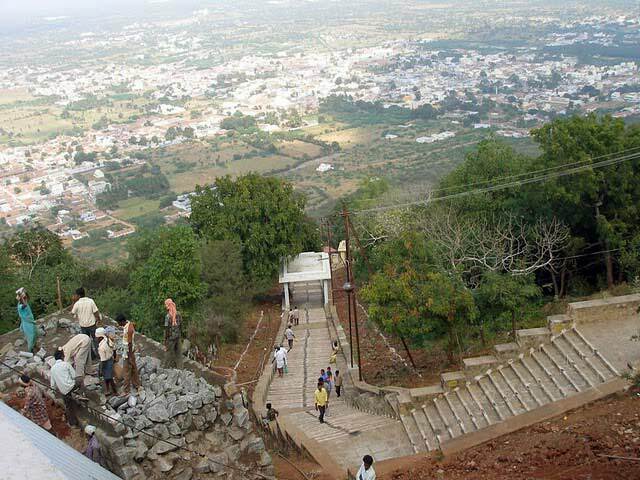 On the way to Coimbatore, this hill temple is about 7-1/2 kilometres south of Ingoor Railway Station. This temple is located in the city of Chennimalai of Perundurai, Erode District. Chennimalai is 26 kilometres from Erode and three kilometres from Perunthurai. Chennimalai can be reached by road from Erode, which is a business centre. The nearest railway station is Ingoor and can be reached by road from Perunturai also. The nearest airport is Coimbatore. The Devasthanam has provided special buses to reach the hilltop. Chennimalai Devasthanam has made some arrangement towards rest houses for the visiting devotees. There are a number of boarding and lodging houses of good standard in Erode. This temple is situated at about 600 meters above sea level and this hill is noted for its natural flora and fauna. This hill also has rare medicinal herbs in its lush green forests. In Devanagiri this hill is called Siragiri and Chenniyangiri. In Tamil it is called Chennimalai. The city underneath the hill is also called Chennimalai. This hill is also called Sigaragiri, Pushpagiri and Siragiri. The Lord of mountains 'Kuringi Andavar', Murugan is highly praised and sung with reference to this abode in Kundruthorādal. Chennimalai is one of them and abounds in natural beauty and splendor. The most famous temple of Lord Muruga in Coimbatore District is Chennimalai. This world famous temple of Lord Muruga is where Lord Arunagirinathar was blessed with "Padikasu", wealth of coins. This is where an unusual phenomenon, rather a miracle took place in the year 1984 on 12th February. A bullock cart with two bulls climbed the 1320 steps on their own on this eventful day. Saravana Munivar wrote the most popular Chennimalai Sthalapuranam before 700 years. Milk and curds are used as special offerings to Lord Muruga in Chennimalai and it is the general belief that curds do not become sour here. The temple of Chennimalai is situated on the banks of Noyal also called Kānchima Nadhi. The Sanctum Sanctorum faces the east. Just in front of the temple we find the Puliyadi Vināyagar. Inside the temple to the right of Moolavar we find the shrines of Mārkandeswarar and to the left Umayavalli. On the left side we find the shrines of Kasi Viswanāthar and Visālākshi. If we take the steps found just behind the Moolavar Sannidhi, we reach the Valli Teyvannai Temple. The two consorts enshrined in a separate temple are a very unique phenomenon. On the top of the hill we find the Pinnākau Siddhar cave with the front yard filled with Vel of different sizes and shapes. This Siddhar is one of the popular 18 Siddhar known to the world for their Siddha yoga. Near this cave we find the Saravana Māmunivar's Tomb. There is also another very ancient cave near this temple. The main deity Murugan is equated to the Sevvai graham or planet Mars and all the rest of the eight planets encircle the Lord in perfect harmony. If one circumambulates the main deity he is believed to get the benefit of circumambulating the navagrahās and worshipping them. As we go further up behind the temple we see the Valli Teyvannai temple. They are in penance to attain Lord Muruga. They are known by the names Amirthavalli and Sundaravalli. A separate temple for Valli and Teyvannai is the most unique feature of this temple. 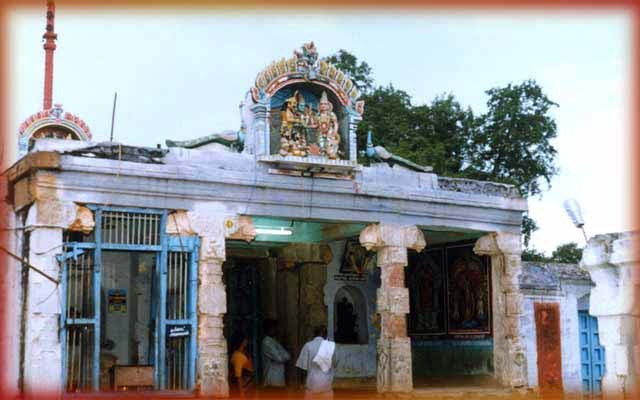 Another most important feature here is that the popular daily prayer of Murugan Devotees, Kanda Shasti Kavacham was first offered to the world in this temple by Balan Dêvarāya Swamigal. From that day onwards till today many devotees keep chanting this prayer every day. The holy water for Abishekam is being brought everyday by the temple bulls, which are being maintained by the Devasthanam. This procedure is also a very unique one not found in other temples. Once in twelve years, during drought conditions a spring gushes out water. This spring is on the southern side of the hill temple. This is a miraculous Divine happening. The Vināyagar near the spring called Mamānga Theertha Vināyagar. The people worship this Vināyagar and the holy springs with great Devotion. This is the first shrine we encounter when we climb the steps. This deity is enshrined in the temple inside the city. Punnakku Siddhar, there is a cave on the hill where this siddhar lived. At the foot of the hills Idumban is enshrined and is worshipped as the village deity. Mamanga Theertham - This spring is on the southwestern slope of Chennimalai just opposite the Vinayagar shrine. Subramanya Theertham - This is found on the northern side of foothill. This is also called Saravanapoigai, Kumara Theertham. Saravana Munivar established this city on banks of this spring (ālayam Kanda Mānmiyam verse 11). Sthala Vriksham is tamarind tree and is found in front of the temple where there is a shrine for Puliamarathadi Vināyagar. The moolavar here is popularly known as Siragiri Dandayudhapani. This deity as per Sthala Puranam gave Dharsan to Saravana Munivar as single faced Murugan after appearing as the six faced Arumugam in the first instance. The utsava murti is Muttukumara Subramaniyar with his two consorts Valli and Teyvannai. The Chennimalai Sthalapuranam has 207 verses including the invocation songs and is divided into six cantos. They are Chepêdu Kanda Mānmiyam, Siragiri Mānmiyam, Pushpagiri Mānmiyam, Kātchi Mānmiyam, Idumbanuku Vazhi Kātiya Mānmiyam, ālayam Kanda Mānmiyam. The author of this great work is the poet Saint Saravana Munivar. This book also mentions that the temple was initially built by Saravana Munivar himself and the festivities were also initiated by him. 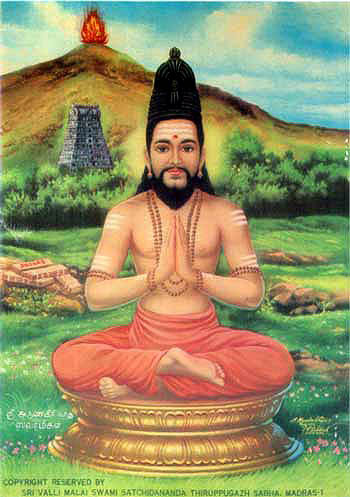 Saravana Munivar went to Palani, Tiruvavinankudi and circumambulated the Palani hills offering prayer and requested the Lord to give him Chennimalai Sthalapuranam. As per Lord Muruga's Divine instruction, Saravana Munivar went to Kanchipuram and brought a copy of the copper plate inscription of Sthalapuranam. He was wonder struck to note the depiction in the Sthalapuranam come alive when he reached Chennimalai. He built the temple of Lord Muruga and also a separate shrine for Valli and Teyvannai. Later he also built a temple for Kailasanāthar near Subramanya Theertham in the city of Chennimalai. He built the shrine of Lord Muruga and Valli Teyvannai in the Chitra Mandapam of this temple. He also made the temple car similar to the one at Palani. The Lord of Chennimalai is enshrined both on the hilltop and in the city. The famous poet Teyvasigamani Gounder brought out the original palm leaf inscription of this Puranam in print. Saravana Munivar constructed the temple on the hill and the city beneath, Kailāya Nāthar temple and initiated the car festival.  In the first half of the 13th Century acres of land where offered to the Lord of Chennimalai. The Minister by name Muthuvasavaiyan of Mysore Devaraja Udayar Dynasty renovated the exterior of this temple in the year 1654. Devaraja Udayar's other Minister Madavāgam Devaraja Iyer sung the Kanda Shasti Kavasam for the king. We find the sculptures of Devaraja Udayar, his wife and Muthuvasavaiyan on the pillar of Valliamman temple. Sengathurai Poosari lived in the 18th century. He was born in Sengathurai of Pallādam Thaluk. At the foot of the Chennimalai hill we find his tomb and Madam. He took renunciation at a very early age, offered himself to the Lord of Chennimalai, and renovated the temple by and large. He built the Mahā Mandapam of the temple on the hill, laid the floor with stones on the hill temple, and constructed the Kailasanāthar temple outer mandapam, inner mandapam, gopuram & tirumathil. On the day of consecration of Maha Mandapam of the hill temple, the sculptor showed him, his sculpture that he had created as a mark of acknowledgement. Sengathurai Poosari immediately said that this stone figure is going to replace him and on the very day he attained the Golden Feet of the Lord. This blessed devotee of Lord Muruga lived in the early half of the 19th Century. His tomb is in Vêttuvappalayam, which is located next to Perunthurai. He lived as a prophet by the Grace of Lord Muruga. He built the footsteps to Chennimalai temple, the lights on the footpath, visitors rest houses, Amman temple, Tirumathil, Palani Poosari Madam, and also initiated the Arthajama puja, Panguni Uttiram car festival and Avinashi car festival. The daily puja is conducted as per the tradition of Kamika Agamam. The puja timings are as at right. On every month new moon day, Shasti and Krittikai special festivals are conducted. On the foothills of the temple we find a stone landmark in the Mandapam built by Vêttuvapallayam Vêlan Thambiran. This gives information on the offering made by Murungai Perunthozhuvar to Lord Murugan during the reign of Kumara Varman Sundara Pandiayan. In the Chennimalai Velavar temple Garbagraham, on the left side of the entrance we find an inscription. According to this inscription this was made in Kaliyuga year 1641. This may be approximately 357 years old. We find another 600 years old inscription and according to the inscription this place is called Pidariyur. The other name Tiruvirundhapuram is also believed to be in existence before 600 years. The Sthalapuranam of the temple was written in the remote past before many centuries. The original was palm leaf inscriptions and was published as a book by Sri. Teyvasigamani Gounder after research and conversation with scholars. Arunagirinathar has made references to this temple in his works. The poet saint Saravana Munivar has also written the sthalapuranam for this temple and has sung many songs on the bliss of salvation and god-Love. Other than these there are many hymns and songs written by Padikasu Pulavar and others.